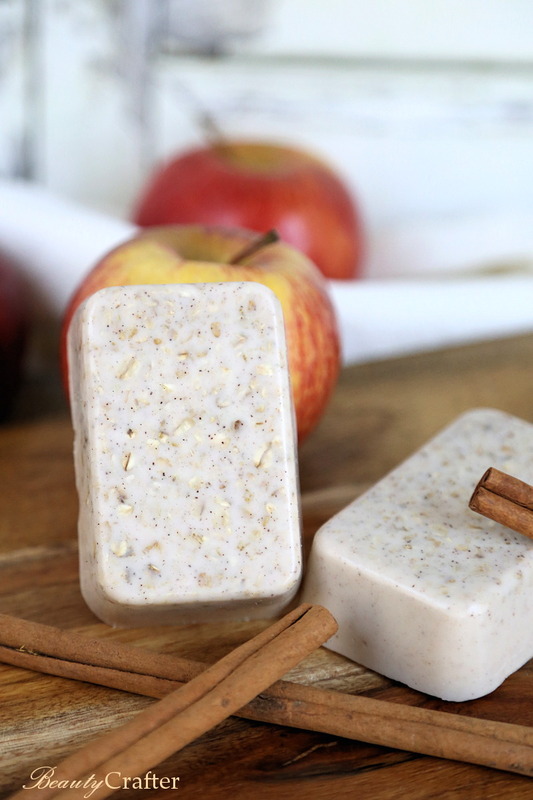 Apple Cinnamon Soap infused with soothing oatmeal is a fun and easy soap recipe to make in preparation for fall festivities. The fragrance of this homemade soap immediately conjures a warm cozy bowl of apple cinnamon oatmeal.. yum! 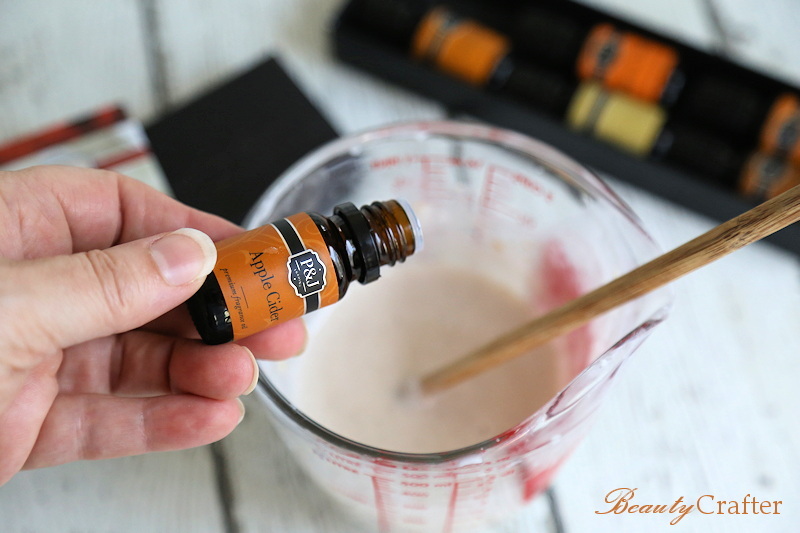 Oatmeal soap is a fantastic DIY gift that is quick and easy to make. Oatmeal Soap the Smells Good Enough to Eat! Besides the divide smell of the apple cinnamon soap, it also features a goat’s milk soap base and oats, both of which are soothing and nourishing to the skin. I also find the rustic touch of adding oats to the soap gives is a great look. Making this Apple Cinnamon Soap only takes a few minutes, but makes a wonderful gift that looks carefully crafted. It is a great beginner soap making project. 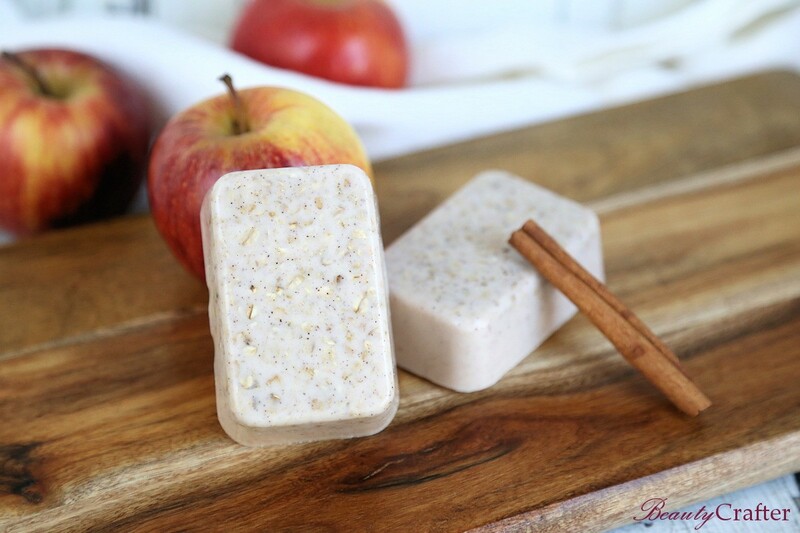 The P&J Spice Fragrance set contains both the apple and cinnamon fragrances I used in making this oatmeal soap, and come with other great fall/baking scents too. I have a number of other projects on the site that use the fragrances from this set. If you like the soap, why not make my Apple Cinnamon Sugar Scrub too! You could make a great gift basket. Everything except the quick oats and cinnamon. Cut and weigh the goats milk soap, then place in microwave safe measuring cup or bowl. Add the cinnamon and microwave until soap base is melted. (roughly 30 seconds). Stir in the quick oats. While still liquid, but slightly cooled, add the apple fragrance (too hot will dissipate it, the oats help cool it, so just wait 30-60 seconds). Stir gently while pouring into mold to ensure uniform oat distribution, yet not create bubbles. Cool until firm, then pop bars out of the mold.